The garage door is the biggest piece of machinery in your home and it can be very inconvenient when it stops working correctly. So we have compiled a quick list of the top ten reasons why your garage door might not be working correctly. There could be plenty of other different reasons, of course, but these ten are the most common and when you call a professional, can be fixed quickly and easily. The first reason might seem really obvious but you�d be surprised how many times people forget to check the batteries in their remotes or transmitters. So before you assume that the garage door isn�t opening because it�s broken, make sure that your battery powered device hasn�t lost power first. If your garage door is closing too fast, then you probably have broken tension springs or cables. Some garage door solutions can be a DIY but we would recommend calling a professional if this is the case, because it can be dangerous to handle the cables and springs of garage doors. 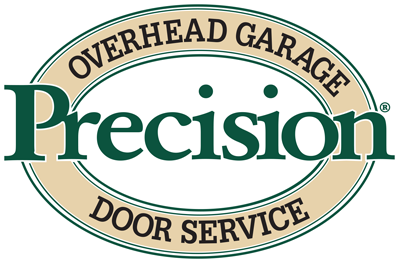 A sign that your garage door isn�t properly aligned on its track could be a rubbing noise when it reaches a particular spot when opening or closing, or maybe it slows down when it reaches this spot. You might also be able to spot gaps between the rollers and the actual rail or bends in the rail itself. If so, this is a serious problem and can eventually become dangerous if you don�t fix it right away. Again, call a professional to handle this so that you don�t put yourself or your family in harm's way. If your garage door is opening properly but won�t close when you hit the button on your remote, this could be because your photo eye sensors are dirty or out of alignment. These sensors are in place so that when anything crosses the invisible beam along the ground beneath the garage door as it�s closing, it will automatically reverse and open up again. This is in place to potentially save lives so that the door never closes on someone, like your child or even a pet. If the sensors are dirty, they might not be able to see each other and thus cannot send a beam back and forth, making your garage door think it shouldn�t close. Once you clean them and it still isn�t closing, it could be because they aren�t aligned correctly. Make sure to put them at the same height and adjust their angles to match. If your door begins to close but then stops and reverses each time, it could be because something is blocking the doors path on the ground, like toys or trash cans, or because something is blocking the door on the track itself. First, make sure there is nothing near the garage door when it is closing and second, check the track itself for any buildup of dirt, dust, etc. Wiping down the track with a damp towel or rag should fix this problem and regular cleaning of the track will prevent this from being an issue in the future. If your garage door isn�t lifting at all, it is probably because of a broken torsion spring. These springs are what do the heavy lifting when opening your door and, like any piece of machinery, can wear down or rust over time. Sometimes people are at home when the springs break and it can make a loud bang. If this is the case, call a professional right away and do not attempt to fix this yourself or attempt to open the door. The springs will need replacing and can be dangerous so leave it to the experts. If you hear the motor of the garage door opener running for a few seconds but your garage door isn�t opening, make sure to check for the problems listed above and if none of them are the problem, then double check to see if your door is manually locked. Many garage doors come with a manual lock and can often be found in the middle of your door. Make sure to unlock the door before attempting to automatically open it again. 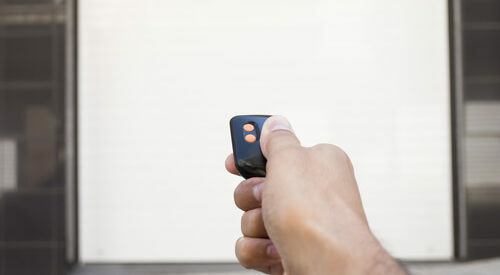 If you hear the motor of the opener running for the full time it would take to open or close the garage door but the door doesn�t move, then the disconnect switch might have been enabled. All garage door openers come with this switch so that if the power ever went out, you can manually open or close the door. The switch is often attached to a rope that can be pulled or a knob that can be turned and sometimes the rope can get accidentally unhooked from the switch. If this happens, the the door is disconnected from the motor. Open or close the garage door all the way, re-attach the rope, and then attempt to open to the garage door with your remote or transmitter. If your garage door opens and closes randomly, there could be one of two things happening. First, make sure that your transmitter isn�t stuck under something or pushed up against something in a bag or in your glove compartment, which would be pressing the button at random. Second, sometimes the frequency of your transmitter can become mixed up with a nearby one, like your neighbor's garage door remote so when he or she uses their remote, it also opens or closes your door too. It is possible to change your garage door frequency or reprogram it, either by consulting your owner�s manual or by calling a professional to help you. If your garage door closes properly but then immediately opens instead of staying closed, it is usually because of the open and close limit setting on your opener. This limit setting is a range that tells your opener how far the garage door should move to be fully closed and if the settings are incorrect, then the garage door assumes that when it hits the ground to close, it is not fully closed and instead is hitting something in its path, causing it to automatically reverse. This range can be adjusted on your garage door motor with some dials or knobs. Check your owner�s manual for the specific range needed for your particular model and you might have to test it a few times before finding the perfect setting. If none of this works and your garage door still won�t stay shut, call a professional and have them look at it for you. We hope this list helped and answered any questions you may have had about problems with your garage door. If you have any more questions or your specific problem wasn�t included in this list, then please call us today and let our expert technicians give you the solution!